If you’ve got a Smartphone, you can control your EOS 6D with it. Or you can use an iPod Touch (Fourth Generation or newer) to control your camera. You can download an app that Canon has created to control your camera and view images stored on the memory card on the device screen. The following steps show how to control your camera with an iPhone or an iPod Touch. 1Download and install the Canon remote app for your iPhone or iPod Touch. The app is completely free. You can download it from the Apple website, which will connect with iTunes on your computer. 2Use the Multi-controller to navigate to the Camera Settings 3 tab. The Settings 3 tab will have Wi-Fi options. 3Use the Multi-controller or the Quick Control dial to highlight Wi-Fi Functions, and then press Set. 4Use the Multi-controller or the Quick Control dial to highlight Smartphone, and then press Set. The Connect’n Method dialog box appears. 5Use the Multi-controller to select Camera point mode, and then use the Multi-controller or Quick Control dial to select OK. The Network settings dialog box appears. 6Use the Multi-controller to select Easy Connection and then use the Multi-controller or Quick Control dial to select OK.
A dialog box appears with the settings you need to connect your smartphone to the camera’s Wi-Fi network. 7Access your iPhone or iPod Touch network settings, and enter the camera network information to connect your device to the camera network. After you enter the information, you see the nickname of the camera as the network to which your smartphone is currently connected. Then, start the EOS Remote app on your smartphone. The app detects your camera. 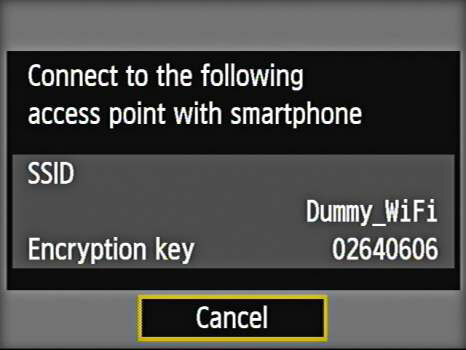 After the camera and device are paired, you see a dialog box on your camera menu that asks you to confirm that you want to connect to the smartphone. 10Use the Multi-controller or Quick Control dial to select OK and then press Set. A dialog box appears, telling you that the settings have been configured, assigning them to Set_1. You can either accept or change the default settings name. If you’re going to work with multiple devices, you should change the settings name as shown in the following steps. 11Use the Multi-controller or Quick Control dial to highlight Change Settings and then press Set. 12Use the Virtual Keyboard to enter a new name for the settings. This keyboard functions identically to the keyboard you used to set the camera nickname. 13Press Menu to apply the changes. The dialog box changes to show that the settings have been configured with the new name. 14Use the Multi-controller or the Quick Control Dial to highlight OK, and then press Set. The Connection screen appears. Press Menu to close the connection.